A stay at Hotel Boutique Los Balcones places you in the heart of Cuenca, within a 10-minute walk of Esqueletologia Museum and Calderon Park. Featured amenities include a 24-hour business center, express check-in, and express check-out. For a surcharge, guests may use a roundtrip airport shuttle (available 24 hours) and a ferry terminal shuttle. 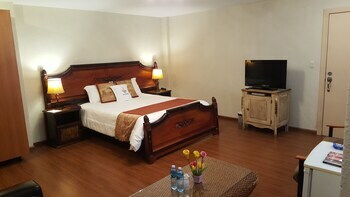 With a stay at Hotel Glamour in Riobamba, you'll be within a 10-minute walk of Olympic Stadium and 21st of April Park. Featured amenities include a business center and a 24-hour front desk. With a stay at Tabuba Guest House in Guayaquil, you'll be within a 10-minute drive of Mall del Sol Commercial Center and City Mall.